With an increasing demand for quality kennel accommodation for dogs and cats, a good boarding kennel is a sound investment and can provide a healthy income if run efficiently. Running your own Boarding Kennels, the only guide of its kind available, is essential reading for anyone who is considering starting out in the business. 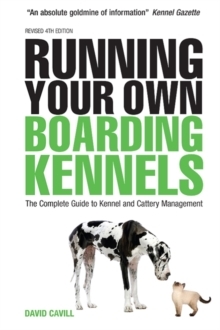 This new edition by animal care expert David Cavill provides advice on every aspect of running a boarding kennel. With an exhaustive breadth of detail it covers every related topic, including: boarding fees, raising finance, insurance, kennel cleaning, dangerous dogs, types of food, exercise, grooming, beds and towels, staff training, accommodation, advertising, puppy and kitten rearing, and product sales. Comprehensive and unique, Running your own Boarding Kennels also includes information on ancillary services such as dog-walking, pet sitting and home boarding.